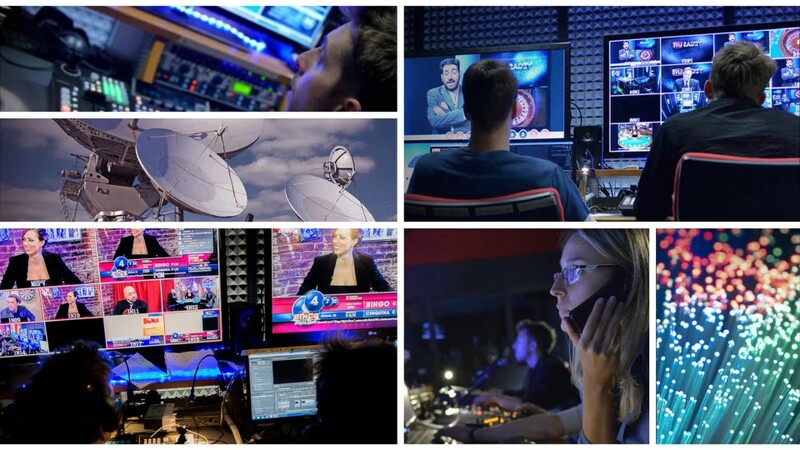 In recent years our organisation has invested in order to deal with the challenge of visual studies, with the aim of dealing with all sectors relating to broadcasting and terrestrial and satellite connectivity universally. The technological headquarters at Genoa is connected via dedicated fibre optic sections to the main Italian and European providers, in order to reach the leading advertisers, broadcasters and teleports. Our satellite network can now transport broadcasting signals and data on the main European platforms, and also reach other continents. We can therefore provide protected solutions with the possibility of redundancy between the satellite fibre cables and any hyperlinks on radio bridges. Our technological headquarters are also equipped with studios for TV and cinema production, HDTV production for live and recorded broadcasting, and post-production and video editing rooms. An entire area has been dedicated to the technical and creative framework used in web design, TV web, social networking, apps and mobile services, e-education, e-commerce, retail innovation, conference management and creation, design, marketing and management of events.